Toilet paper holder in the shape of a classic VW Beetle's back end. Made of bright red plastic with dark blue-tinted windows, chrome-colored bumper and hubcaps, black tires, and amber taillights. The toilet paper roll rides on an "axle," and one tire is easily removed to change the roll. Toothed metal cutter allows for quick tearing of toilet paper sheets. 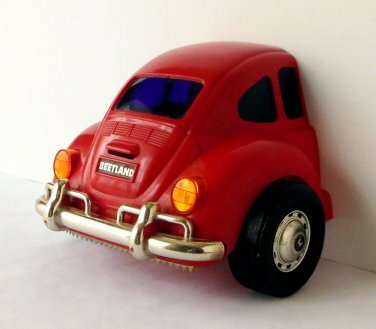 Whimsical details include the famed VW logo on the hubcaps and a license plate that bears the name "Beetland," which was a novelty and toy company in the late 20th century. Delightful way to display your enthusiasm for an automotive icon. Made in Japan. Manufactured by Masuda Metal Press. Includes original box, mounting screws, and instructions. Box marked: "Manufacturer Masuda Metal Press Ind. Inc. 1-15-17 Takaracho Katsushika-ku Tokyo" and "Distributor Full-House Co Ltd. 2-12-5 Higashikomagata, Sumida-ku Tokyo"
Box sticker marked: "Made in Japan for Goods:Boston"
Contact for more photo and details.